What exactly did Shakespeare write about and why is he so popular? His enduring tales of love, jealousy, betrayal, revenge, corruption, family, feuds, ghosts, witches and murder are explored and explained in this wide-ranging book. Provides information on Shakespeare's life and Elizabethan drama, his greatest plays, poems and songs, and his use of language. Includes a guide to his plays, a Who's who in the world of Shakespeare, and a glossary of Shakespearean words and characters. With over 200 internet links to downloadable pictures and useful websites to find out more and listen to extracts from plays. 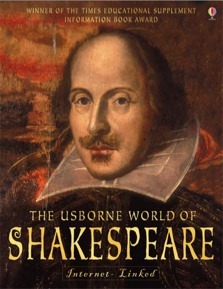 Readers of any age would find The Usborne World of Shakespeare fascinating.